Spring has sprung! Deck yourself out in freshly-cut grass green and be inspired by the blooming buds on trees and bushes. The annual Met Gala, which occurred Monday night at Metropolitan Museum of Art’s annual Costume Institute Gala in New York City. Every year there is a theme if you can remember last year’s punk dress code. Since the gala was honoring American couturier Charles James, an English-born American designer known for his structured wiring and lavishly heavy gowns, guests were asked to channel James’ formal aesthetic of gowns for ladies and white tie (with decorations) for men. Above all I think my favorite of the night was Rihanna. The gal can seriously do no wrong. She stunned in a Stella McCartney number that included a cropped top with a stunning open back and a floor-length skirt with a full train and draping along the back. Naturally Beyonce, and her hubby Jayz killed it as well–he actually proposed to her again when one of the many jewels from her Givenchy wrap dress fell off. So yeah, my jealousy continues. Leah Michele in Joseph Altuzarra and the Beckhams in Ralph Lauren and Victoria Beckam’s own design, all dazzled on the red carpet. All white ensembles proved to be a BIG trend on the red carpet. After 4 years of anticipation, Kate Moss is at it again with her 15th collection for Topshop. “The Icon Is Back” according to Topshop’s website. Moss described this collection as a “wardrobe autobiography”; she drew most of her inspiration for the line from pieces in her own closet. Moss told Harpers Bazaar, “With this collection we had more time, so we could really be selective about the pieces that are included. Each one is a statement piece.” The collection features 40 items from heavily detailed evening wear to luxurious silky pajama pieces to printed wide leg trousers. The craftsmanship was something Moss was really specific on. The collection incorporates soft suede, silk chiffons from London, lace from India, fringe and hand beaded sequin details. The prices range from $76-$1,200 and the collection is available in store and online at Topshop, Nordstrom, Net-a-Porter and shopBAZAAR.com. Check out the look book below modeled by Kate Moss herself, of course. Some days start off worse than others. Can you say January 1st, July 5th, and whatever the day after St. Patty’s day is. Well today might just be one of those days for you. Through the power of science you can cleanse or scrub away last night while also adding some pep to your step. Clean and Clear offers a line of morning burst cleansers and scrubs, some even have caffeine in the formula to keep those pesky dark circles at bay. Cheer up, pop some Aspirin, chug some water, and throw on some sunnies. You got this! Happy Cinco de Mayo! Don’t just drink margaritas and chow down on chips and salsa today–celebrate with your wardrobe and accessories too! 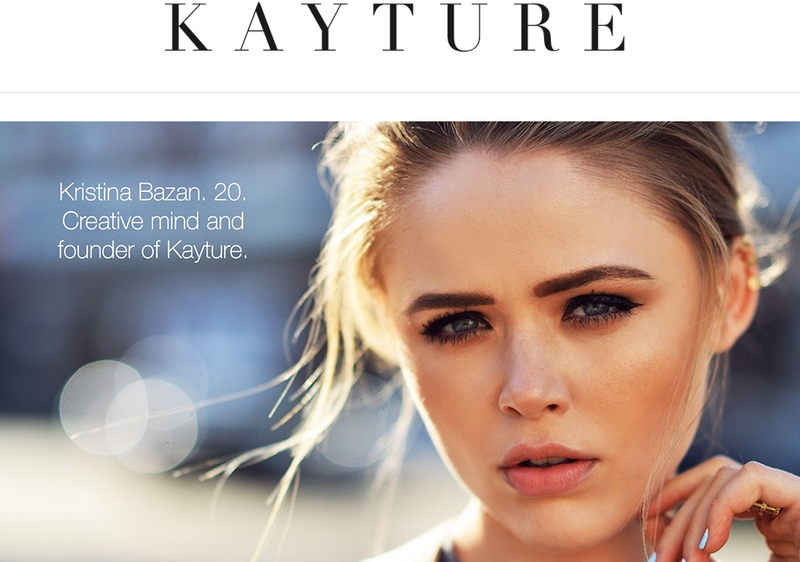 Earlier this year I stumbled across Kristina Bazan’s blog, Kayture. Not only is it a clever play on words (think couture, people) but it’s absolutely amazing!! 20 and Swiss born, Kristina travels around the world with her partner James Chardon blogging about her fashion adventures and finds. As if I didn’t feel inadequate enough, she also regularly works high-end brands, from Louis Vuitton, Dolce&Gabbana, Yves Saint Laurent and Dior to Mango, Guess, and Jimmy Choo. Not to mention she has been featured in magazines like Vogue and Cosmo. She usually updates her website every 2-3 days sometimes more frequently; but her instagram account has several posts a day!